Initially, up to 1825 home circuits initiated missionary operations at their own discretion, and sometimes this caused financial burdens. The heart for mission went ahead of the financial resources. These first missions were in the British Isles as Primitive Methodism expanded its base. After 1825 the General Missionary Committee gathered the donated funds, and determined the consequent distribution. Thereafter in the middle years of the nineteenth century mission is often referred to as a Home and Colonial enterprise, with other missionaries sent to British colonies. 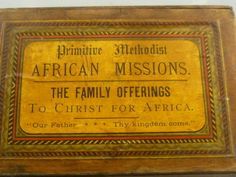 In a connexion very aware of chapel and circuit debt, fund raising was vital, and all the principal Methodist denominations issued collecting boxes. Typically circuit reports in the Primitive Methodist magazines highlighted special collecting results by individuals, so for example the Burland circuit in 1858- but it could be one of many such reports every year. In March 1858 as well as the public meeting proceeds and associated public collections, in this case at Wrenbury Heath and Sound Heath, the individual boxes at Wrenbury belonging to a Mr Taylor (£5-2-81/2p), Mrs Ridgeway (£1-8-0d) and at Sound Heath Mrs Weever (£2-10-3d) all received special mention. 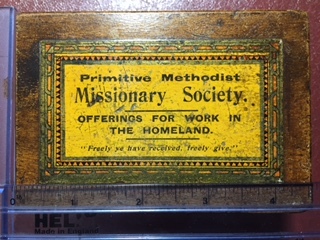 Formal reporting by the Primitive Methodist Mission Society began in 1843. It was not though till 1870 when missionaries were sent to Fernando Po, and so the Primitive Methodist overseas mission arena was Africa, –Fernando Po, Nigeria, and what was then Southern Africa. The establishment of the Africa Fund supported this. Mission boxes were a major way of collecting the funds. BOX A is an early Homeland box, the size is smaller than the later ones, and the construction utilitarian rather than ornamental. It was there for a purpose. BOX B is larger and upgrade in wood and varnish, and it is for the Africa fund.